Gardeners today want exciting plants that are easy to maintain, drought-tolerant, low cost, and deer-resistant. Impossible? 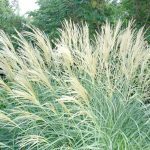 Ornamental grasses meet those requirements and feature ease of establishment, unusual textures, and movement, plus many of these provide winter interest, too. ‘Golden Chain’ Giant Reed (Arundo donax) resembles corn stalks, a dramatic effect in the back of a sunny border. While the species spreads and can reach 12 feet, a new, variegated variety, ‘Golden Chain’ has gold and green stripes and is more behaved at 5-6 feet. Sedge or Carex is a low growing group (less than 12 inches) for part-shade with insignificant seed heads in spring. Use these for their foliage as specimens in containers or in groupings in front of a border. A new Carex ‘Ice Ballet’ (Carex morrowii), a sport of ‘ Ice Dance’, has 12 inch green blades with a wider cream margin than its parent. It forms a dense, upright arching clump that expands slowly by rizomes. ‘Silk Tassel’ (Carex morrowii var. temnolepis) has very fine silvery green blades performing well in semi-dry areas. The native Seersucker Sedge (Carex plantaginea) has interesting rippled leaves. 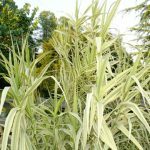 Japanese Silver Grass (Miscanthus sinensis) is a clumping grass that varies in height, blade width and color and is used as a specimen or hedge in sunny borders. Their feathery plumes look fabulous in winter gardens or in arrangements. In our warmer climate, it is best to use varieties that bloom later to discourage unwanted seed germination. Two nice cultivars are Dwarf Maiden Grass ‘Adagio’ (5 feet with blooms) with fine-textured leaves that turn burgundy in the fall and Variegated Maiden Grass ‘Morning Light’ (6 feet) with fine-textured green and white variegated blades. Switch Grass (Panicum virgatum) is a beautiful, yet tough, upright clumping grass native to the prairies. It withstands wet or dry soils and forms delicate seed panicles mid-summer. 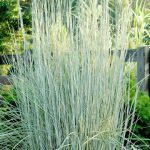 Upright Switchgrass ‘Northwind’ (5-6 feet) has bluish-green foliage, creamy seed heads and can be used as a vertical specimen or background accent. 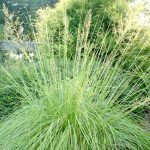 Dwarf Red Switchgrass ‘Cheyenne Sky’ (2 ½ to 3 feet) is a new smaller type with blue-green and burgundy foliage for specimen use or in sweeps. Fountain Grass (Pennisetum) is a clumping grass with mid-summer “bottlebrush” seed heads that takes our hot humid summers. Dwarf Fountain Grass ‘Cassian’ (3 feet with summer plumes) works well as an accent or in sweeps. The foliage turns yellow with orange streaks in fall. 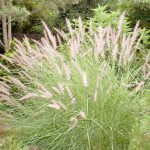 Oriental Fountain Grass ‘Karley Rose’ (Pennisetum orientale) blooms from spring to fall with light pink bottlebrush plumes (2 feet). 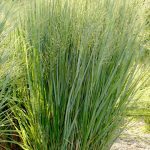 Little Bluestem (Schizachyrium scoparium) ‘The Blues’ (3 feet) has dusty blue blades with burgundy streaks, turning copper in the fall. This prairie native for sun attracts birds and is a larval host for several butterfly species. It is stunning in sweeps or as a specimen with delicate white flowers at summer’s end. Prairie Dropseed (Sporobolus heterolepis) is another prairie grass (2-3 feet) useful for massing. This fine textured silvery green mound, with delicate arching panicles displayed by mid-summer, turns copper-orange in fall. 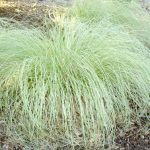 Grasses can be planted from late spring through early fall. They will establish quickly, only needing to be cut back in late winter. It’s important to space your new grasses to allow room for growth. A good rule is to space grasses as far apart as they will become tall. Prepare the soil with compost to a depth twice as deep as the root ball. Set the plant into the hole so the root ball is slightly deeper than the plant was growing in its container. Fill the hole with water. Fill the hole with soil. Water again. Keep watered (one inch per week) until the plant is established. Add a slow release fertilizer in the spring. Plant now and add some new excitement to your landscape.